Indians Bought Gold Online This Akshay Tritiya; Offline Sales Go Down! Akshaya Tritiya is an auspicious occasion for Hindus and Jains, who consider this phase as one of the holiest to start new ventures and new activities. Buying gold on Akshaya Tritiya has almost become a tradition as new investment and new businesses started on this day will bring good luck. There can be several reasons for better online sales of Gold this season such as high temperatures in North India which is enticing gold buyers to purchase from the comfort of their homes. And another solid reason can be the huge discounts and offers promoted online. 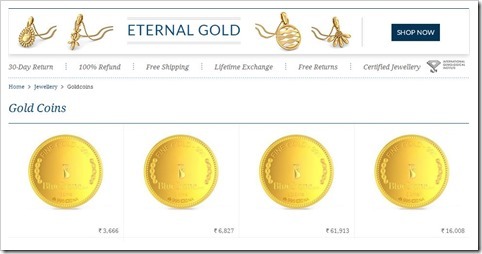 Online shopping portals are also offering same day delivery of Gold so that the gold is delivered right on the Akshaya Tritiya days which are May 1 and May 2 can also be attributed to increased online sales. And the average order per online customer has also increased from Rs 12,000 to Rs 18,000 this Gold season. Traditionally, Gujarat has been the most active market for Gold during Akshaya Tritiya occasion. And if we consider the fact there are almost 30,000 weddings in Ahmedabad on Friday, May 2, then it becomes even stronger reason to assume that gold sales will hit big time. But strangely, offline sale of Gold in Ahmedabad and nearby regions has stagnated this Akshaya Tritiya season. Due to the slowdown in business and high gold prices , consumers are waiting and watching the market before committing any purchases. And this is the reason offline sales haven’t actually picked up as expected. Last years too, offline sales of Gold were 25-30% less compared to 2012. This year, bullion traders and jewelers are hoping that sales atleast match that of 2013 levels. If we talk about Gujarat, then traders and gold experts are expecting 500 KG worth of gold sales in the state meanwhile 150 Kg of gold sale in Ahmedabad. Due to less supply of Gold, including less imports, there is a shortage of Gold as well, which is actually driving the prices high. Banks are selling gold at all time high premium. The premium of 10 gram of gold is in the range of Rs 1000 to Rs 1200 meanwhile prices range from Rs 30,000 to Rs 30,6000, making it an expensive investment this Akshaya Tritiya season. Are you buying gold on this auspicious occasion? Are you choosing online portals or going for the offline route? Do share your gold story by commenting right here! Why Did Nokia Chose Rajeev Suri As Their New CEO?